Unplug this Labor Day at these local community spaces. Are you already getting that itch to start planning for the holidays? Don’t worry, we’re not quite there yet either. First we need some inspiration. What better way to kick off the Fall season and celebrate Labor Day than to get out and go exploring?! Reflecting on what this weekend really stands for, we want to inspire you to unplug from technology, stop thinking about work, get out of the house, and enjoy exploring the creative community spaces located right in your back yard here in beautiful Central Florida. We’ve gathered a few of our favorite local creative places and listed them here to share with you! This list is short and sweet, but by no means complete (rhyming unintentional, but catchy right?). Discover your own awesome community spaces and let us know your favorites! From beautiful natural parks to one-of-a-kind experiences, we hope this list inspires you to go on an adventure! Then, just maybe we can start thinking about planning for the holidays. So without further ado, here are a few of our favorite totally unique local creative spaces that we just can’t get enough of here at Adjectives. First, take a step back in time. Built almost 100 years ago, this original artist community is tucked away on its own quiet cobblestone street in Maitland, Florida. You’ll feel like you’ve stepped back in time as you walk around this unique facility and find a peaceful courtyard, an intimate outdoor chapel, multiple gardens full of beautiful flowers and a lily pond. Plus, enjoy those famous cypress tress that will keep you cool on a hot summer afternoon here in Central Florida. This is a true artist community that hosts year round art classes and workshops taught by local, passionate artists and experts in many different fields. There’s a fabulous art gallery, a history museum and many charity galas and events held here, supporting the local art community and creative education. Take the kids for a stroll, soak up some sunshine, while keeping cool in the shade. Enjoy some history and get your fill of creative inspiration! It’s free to walk around and explore the Maitland Art Center. Visit their website to learn more and find out how to visit the Art Gallery for free too. Organic food. Local drinks. Great music. One of Winter Park’s (not so) best kept secrets is the garden community of East End Market in Audubon Park. Before you even step inside you will know what this special place is all about. The proud community garden is right out front along with shaded picnic tables and they now offer bike rentals! Smell the fresh herbs and veggies that you will soon taste when you order your fresh farm-to-table style meal from one of the several locally-based eateries inside. As you walk in, enjoy letting all your senses come to life as you connect with local artisans, talented chefs, sweet baristas, and bartenders who are humble, genuine and happy to chat with all the community members that come to enjoy this eclectic place. Grab an organic local beer from Local Roots Bar. Savor a tasty green smoothie from Skyebird Juice Bar. Sip on a fanciful latte from Lineage. Or just explore the unique creative gift shops that will surely spark your imagination! No matter your style, you will discover something unique and new to love at East End. Don’t forget to check out the community board to see when to catch their next live music concert and any other fun events going on. Discover more about the unique culture of East End by reading this great article by The Bungalower. Dog or no dog, you will love this place. Calling all dog lovers and nature lovers alike! 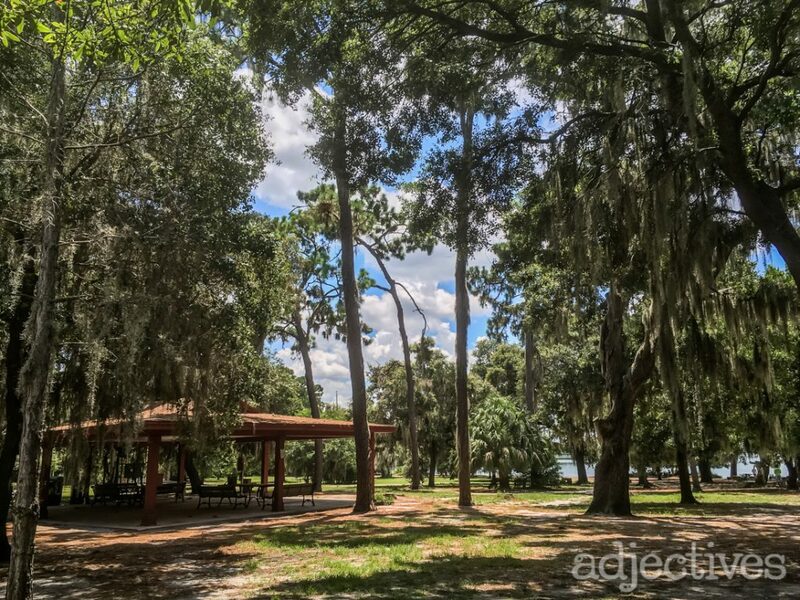 Whether you have a dog or not, you and the family will love venturing out to this local lakeside beach park with a beautiful view, tons of space to play, huge trees (that means shade!) and plenty of picnic tables and hangout spots. Totally free with great amenities, Baldwin Dog Park is more than just a dog park. It’s one of our favorite parks in Central Florida! You can enjoy coming to this local hidden gem whether you have a dog or not! Tucked around a corner of Lake Baldwin in Winter Park, this wide open park is diverse with shaded and sunny spots all around. There are paths to explore, a large covered picnic area for gatherings, plus plenty of great seating around the park to watch the pups run free! It’s a place for peace and quiet yet it’s full of energy with characters from all walks of life. Us locals love it! You come to a dog park and you realize that the dogs just know how to be themselves. It’s a dogs play ground, and every dog’s motto is just have fun! After their fun in the water, give your pups a bath in one of the huge washing stations designed just for you. If you have a dog this place is a must visit local spot. If you don’t have a dog, come anyway. And be forewarned, you might want to get a dog after you visit! Our local creative community rocks. We’re so excited to live, work and play in such a creative and diverse area that encourages local businesses and community members to collaborate. We thrive when we are all creating together and it really does make everything that we do here at Adjectives truly worth doing. Central Florida is full of hidden gems and the ones we’ve mentioned above are just the start of what we would love to share with you. This Fall season we’re all about going “tech-less” and this list will surely get you thinking about unplugging and enjoying life (even for just a short time) without the constant interruptions of technology. Have a tech-less Labor Day weekend and celebrate your Interior Declaration in style! Go outside and enjoy exploring the spaces that make up your beautiful home and community. Do you have a favorite local community space you can’t live without? Tell us about it and we may feature it in a future installment of our community rundowns!